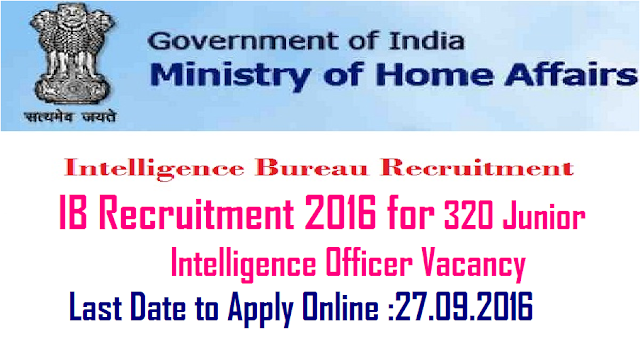 Intelligence Bureau (Ministry of Home Affairs)| Government of India |JUNIOR INTELLIGENCE OFFICER GRADE – II (TECHNICAL) EXAMINATION 2016|IB Recruitment 2016|Intelligence Bureau (IB) (Ministry of Home Affairs, Govt. of India) will hold Junior Intelligence Officer (JIO) Grade - II (Technical) Examination 2016. The IB invites Online Applications from Indian Nationals for direct recruitment of Junior Intelligence Officer Grade - II (Technical) for filling up 320 Vacancies in 2016-2017. 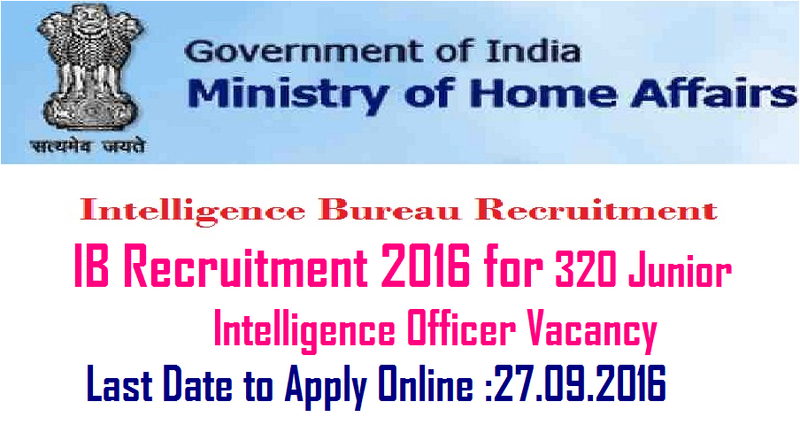 The online registration start from 3rd September 2016 and close on 24th September 2016|Intelligence Bureau invites applications for the post of 320 Junior Intelligence Officer in the Intelligence Bureau, (Ministry of Home Affairs), Government of India. Apply Online before 24 September 2016. Educational Qualification : Higher Secondary (12th) with Mathematics and Physics, and Two years Industrial Training Course from a recognized Institute in Radio Technician OR Electronics OR Electronics & Communication. Selection Process : Selection will be based on Written Test & Trade Test. Application Fee : Candidates belonging to General/OBC have to pay Rs. 50/- through Challan. All SC/ST and female candidates are exempted from payment of examination fee. How to Apply IB Vacancy : Interested Candidates may apply Online through the website http://www.mha.nic.in/ from 03.09.2016 to 24.09.2016.